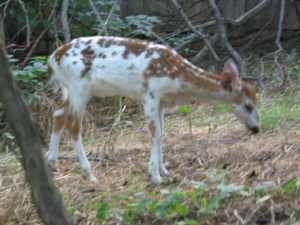 White Tail Deer fawns are primarily born from mid-May to mid-June. However, they can arrive as early as April and as late as the beginning of August. 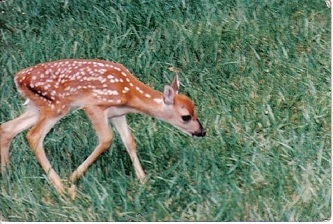 Most does will have one fawn, but occasionally twins or triplets are seen. 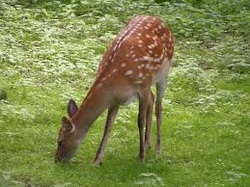 Fawns have no scent. To avoid leaving her own scent, the mother only stays close to her baby to feed in the early morning and early evening. 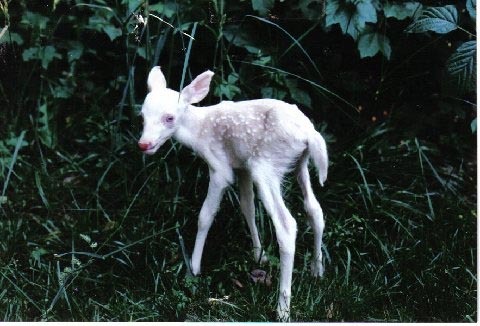 Do not assume a fawn has been abandoned just because you don’t see the mother. In most cases, she is close enough to see you and will not approach the baby while you’re there. Signs of a fawn that’s been abandoned include loud bellowing or crying, roaming around as if looking for mom, being covered with flies and/or maggot eggs or larvae, and/or appearing excessively weak. If you’re in doubt if you’ve found an orphan, please leave the animal where you found it and call a licensed wildlife rehabilitator. Don’t be surprised if you’re instructed to please leave the animal where you found it and return at dusk or dawn to see if the mother returns. If it’s not possible to camouflage yourself from the mom, return later in the morning/evening to see if the fawn appears to have been fed. If you are reasonably sure that the animal is an orphan, or if it is injured, it is important to get the animal to a rehabilitator that specializes in deer as soon as possible. Fawns have no scent. Their defense is to lay still and quiet. Although the animal may seem calm and docile,it is likely scared to death, and they are a high stress animal. Too much handling or changes in the environment can quickly lead to capture myopathy, which is ALWAYS fatal. Additionally, it is important that they are raised with as little human interference as possible. Their lives literally depend on them having a healthy fear of man. Step 1: Keep warm. Place fawn in dog carrier, dog crate (if calm) or large box w/the top secured and air holes (unless otherwise instructed by a rehabilitator, fawns do not need a heat source.) In a dark and quiet room, garage, shed or barn. Step 3: Do not feed any milk or baby formula. Animals are lactose intolerant. Regular milk or baby formula will kill a fawn. Call a licensed rehabilitator that will instruct you if the animal needs to be rehydrated prior to bringing it into rehab. Step 4: Injuries, cat or dog attacks. Fawns that have injuries or have been attacked by cats or dogs will need antibiotics within the first eight hours to prevent infections from bacteria. The baby's best chance of survival is to be taken to a wildlife rehabilitator as soon as possible.